What's the coolest part of the Iron Man movies? The hyper-intelligent Artificial Intelligence that helps Tony Stark by doing data analysis, charging his armor, presenting information at crucial times and doing other business operations. That's right — we are talking about J.A.R.V.I.S., Iron Man's personal assistant. We all dream of having one of its kinds, and even Facebook's Founder and CEO Mark Zuckerberg has ambitions to live more like Iron Man's superhero Tony Stark. 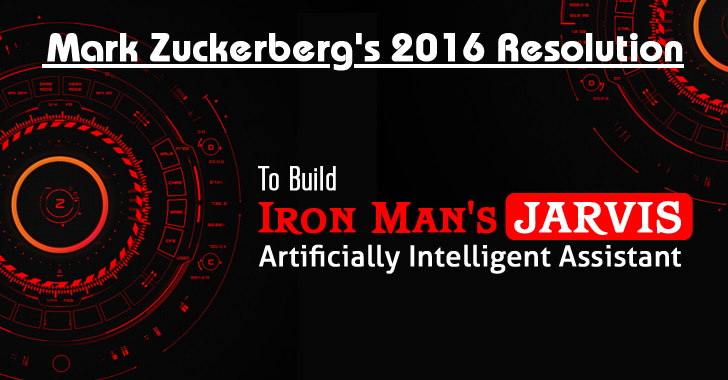 While disclosing his 2016 resolution via a Facebook post on Sunday, Zuckerberg revealed that he is planning to build his own Artificial Intelligence to help him run his home and assist him at office — similar to Iron Man's digital butler Edwin Jarvis. "You can think of it kind of like Jarvis in Iron Man," Zuckerberg wrote in his Facebook post. "I'll start teaching it to understand my voice to control everything in our home — music, lights, temperature and so on." "I'll teach it to let friends in by looking at their faces when they ring the doorbell. I’ll teach it to let me know if anything is going on in (daughter) Max’s room that I need to check on when I'm not with her. On the work side, it’ll help me visualize data in VR to help me build better services and lead my organizations more effectively." But you do not expect to run your own house and office with Facebook-branded Artificial Intelligence anytime soon. As, Zuckerberg said that he is building the robot for himself that works for the way his home is configured, not yours. Other major technology companies, like Microsoft and Google, have also been doing more with Artificial Intelligence and Deep Learning in the past few years as well. However, if the tech billionaire would be successful in creating a real-world Jarvis, then it would definitely take smart-home technology to the new heights.